Who doesn’t love a holiday devoted to delicious tasting treats and the possibility of a good trick? I especially enjoy greeting the little ones dressed up in their Halloween finest and hearing their sweet little voices chant, “TRICK OR TREAT,” at the front door. They look so adorable waiting for a sweet treat. Here is a quick recipe for some charming Halloween Treats to keep around the house just in case a ghoul comes knocking and asks for a trick or treat…. Prepare cupcakes according to the directions on the mix. Bake and cool cupcakes. While the cupcakes are baking and cooling, divide the frosting into four small bowls. Add a few drops of liquid food coloring to each bowl to get the shades that you want to use to decorate your cupcakes. Next, put the star tip into the pastry bag and add the contents of one bowl to the bag. 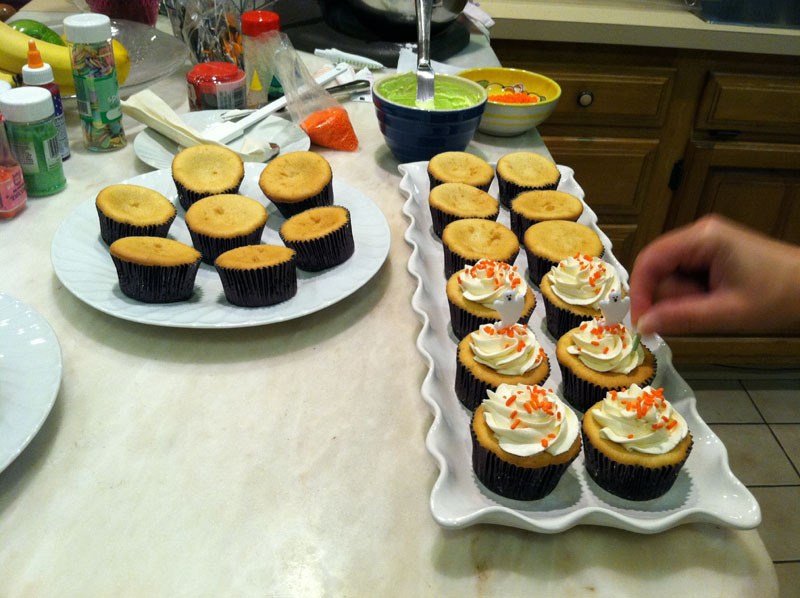 Pipe the frosting on top of 6 cupcakes starting at the outer edge and moving inwards in a quick circular motion. Repeat this for each color. Wash the pastry bag after using each color and dry the pastry bag well so that the colors do not run together. For those of you not experienced in using a pastry bag to frost your cupcakes, you can simply frost the cupcakes with a knife or an offset spatula. Now it is time to add the decorations! 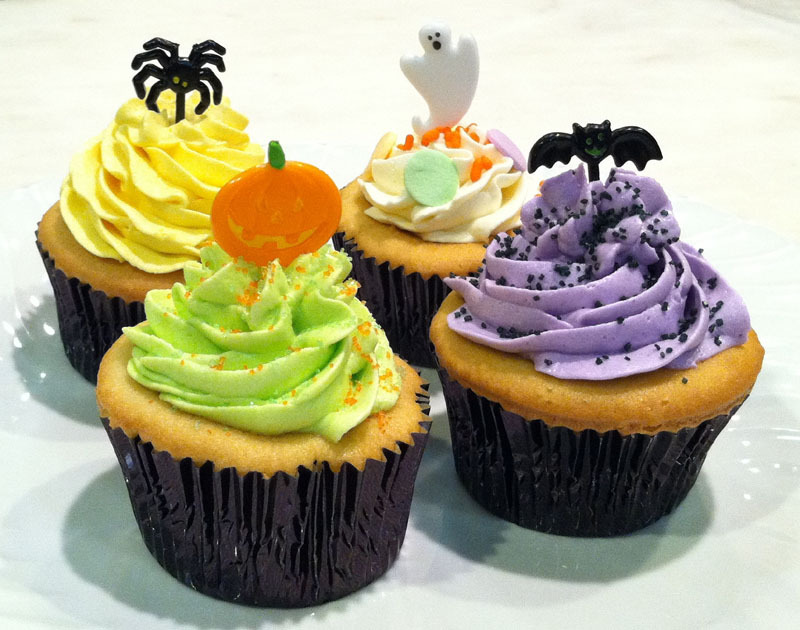 Add the Halloween Picks to 12 cupcakes and then a sprinkle of black sugar crystals. On the other 12 cupcakes you can add black sugar crystals or leave them as they are to create a contrast. Mix and match the cupcakes on a platter and ENJOY!